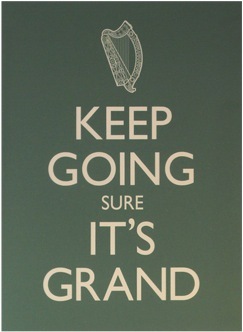 Faced with adversity the English would famously display a stiff upper lip.What about the Irish? We used to turn adversity into blarney: World War II was just an 'Emergency' sort of thing. Sure it's bad, but it's not that bad. But the English lost their stiff upper lip a long time ago (permanently, after the death of Princess Diana) and now the Irish have lost their blarney. Sometimes things really are that bad. 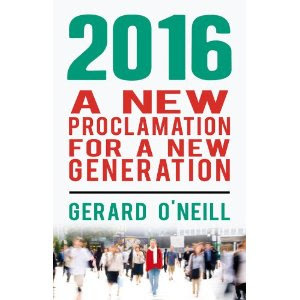 As I observed recently, the Irish people's psychological connection with the future has been severed by adversity, and like all wounds it's going to take time to heal. 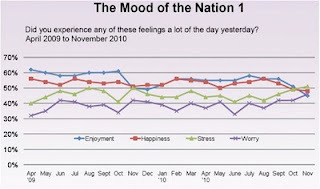 One measure of the wound comes from my company's latest report on the mood of the nation. The two charts below show the percentage of adults each month who experienced any of the listed feelings 'a lot of the day yesterday'. 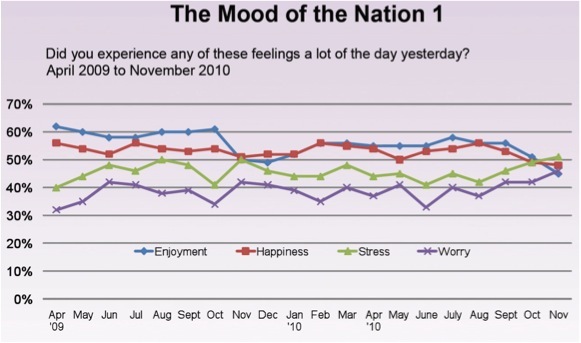 We've been tracking the answers since April 2009, and in the November 2010 wave the percentage experiencing stress exceeded the percentages experiencing enjoyment or happiness for the first time ever. All other negative emotions - including anger - reached their highest levels since we began measuring them. The fieldwork for the November wave of research coincided with the IMF visitation, as well as the onset of the bad weather. Perhaps the results are not that surprising come to think of it. But I wonder if something deeper is happening? After three years of recession, with the prospects for recovery disappearing over the horizon, have we just had our 'Princess Di' moment? 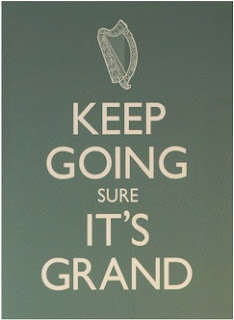 And if things are no longer 'grand' then what are the consequences for our future? The danger as I see it is that we may be near (or even beyond) a tipping point in terms of 'contagious pessimism'. Once despair becomes endemic, it can quickly morph into even more harmful patterns of behaviour. Like the mass emigration of our young people even when there are options for (many of) them at home ('sure everyone is leaving'). If we are faced with contagious pessimism then we quickly need a countervailing epidemic of optimism. About which I will have more to say in a future post. I think the change is beginning to happen, Gerard. It's starting to dawn on many of us that there is no other choice now but taking control of our own lives and destinies instead of waiting for a gang of glorified county councillors to do everything for us. About time, say I.